Device mounts in place of the common peephole and has LCD screen on the inside of the door. Z-Wave or ZigBee capabilities enable it to be incorporated into a connected-home system. CEDIA 2015, Dallas, TX—Yale has been shipping Z-Wave and ZigBee smart door locks for years. Now the company is expanding its home-security line with a doorbell camera that can be mounted in place of the common peephole. 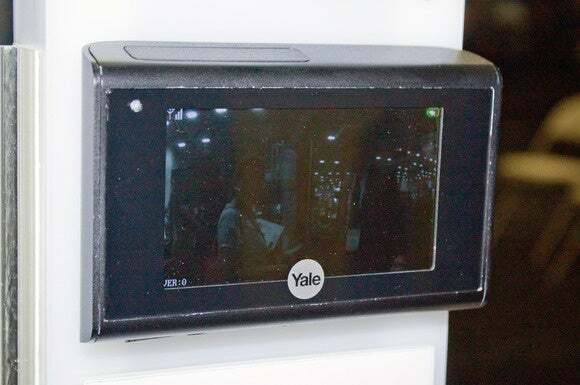 Unlike most of its competitors, the Look Digital Door Viewer delivers not only two-way communication between people on either side of the door, but it can also be incorporated into a Z-Wave or ZigBee connected-home system. The module that mounts outside the door features a motion sensor, a peephole that doubles as a camera, a mic and speaker for the intercom, and—of course—a doorbell button (the motion sensor will alert you to someone’s presence whether or not they ring the bell). The camera delivers a viewing angle of 105 degrees, and there are built-in infrared LEDs to assist in night viewing. 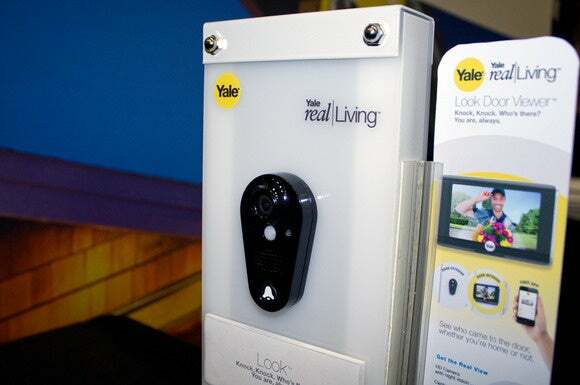 The Yale Real Living Look doorbell camera features a 3.5-inch color LCD on the interior side of the door. The interior module sports a mic and speaker for the intercom, plus a 3.5-inch LCD that displays who and what is on the other side of the door. You can see the view screen up to 10 feet away, so you don’t need to get uncomfortably close to the door if the person on the other side looks suspicious. The interior module also has microSD card slot for storing recorded video. The apparatus runs on four AA batteries. The $180 base model operates on Wi-Fi, while the $200 model includes your choice of a Z-Wave or ZigBee radio module. Android and iOS apps let you monitor the door and communicate with visitors using your smartphone or tablet from anywhere you have Internet access. The Look will be available sometime in the first quarter of 2016.